I woke up this morning to discover a snowy wonderland outside my window (Winter, you can honestly leave now …) and figured what would be more appropriate on a day like today, than some personalized spa time? Fresh Beauty, while a brand that’s not exactly new to me, is also a range I haven’t fully explored until lately and so today I’m chose to show some recent discoveries that my skin & I have quickly come to absolutely love. That doesn’t sound too weird, does it? By the way, I listed several of the products seen in this post in my skincare series that I posted on my Insta Story — you can catch it all on my highlights (@ommorphia under the skin care tab in my bio). 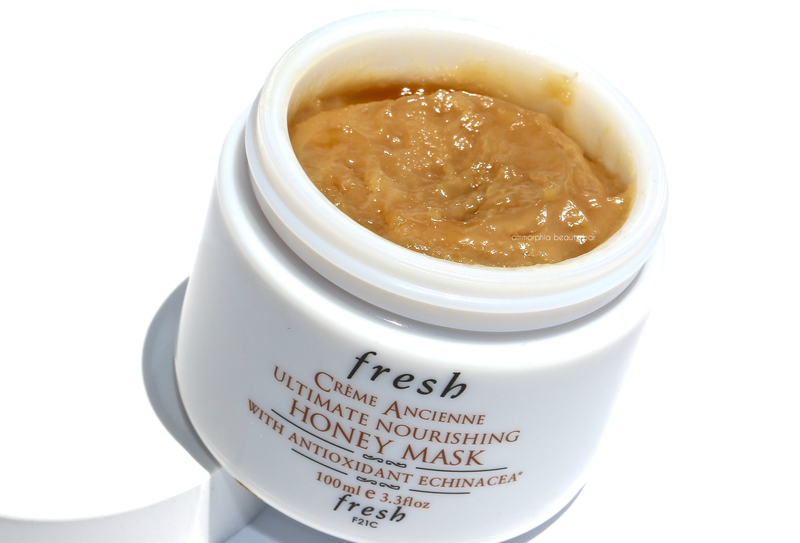 Crème Ancienne Ultimate Nourishing Honey Mask (CAN $172.00) | Masks have become an integral part of my skincare maintenance routine and the season will often determine which type I’ll reach for. As someone with normal/combination skin, the colder months seem to bring out a thirstier side to my complexion and that’s when I look for products that help bring some much needed moisture back in. Enter this mask, made with 40% honey (intensely hydrating & has antibacterial properties), echinacea (a powerful antioxidant to help skin recover from environmental stresses), Meadowfoam Seed Oil (high emollient essential fatty acid composition to nourish skin), Vitamin E (which helps to support skin as it ages), Shea Butter (renown for its nourishing benefits), and Seabuckthorn Oil (rich is moisturizing omega acids). This mask is positively redolent with a true honey fragrance — not the sickly sweet scent of a commercial grade product, but real honey as in right off the comb … and I would love it even only for that alone, but the best is yet to come. Yes, it’s pricey but a little really does go a long way and one jar should last months (unless you’re slapping it on daily, in which case you’re on your own) which could potentially offset the high cost. After applying a light layer, I prefer leaving this one for anywhere from 25-35 minutes (unlike the 8-10 minute time listed in the directions) and have a washcloth handy to help in the removal, as it is somewhat stickier than other masks. The end result is that my skin feels unbelievably soft, smooth, and absolutely hydrated. TIP: after opening, toss the inner plastic lid as it will have a tendency to stick to the rim of the jar, and thus make removing it later a very frustrating task; I speak from experience. 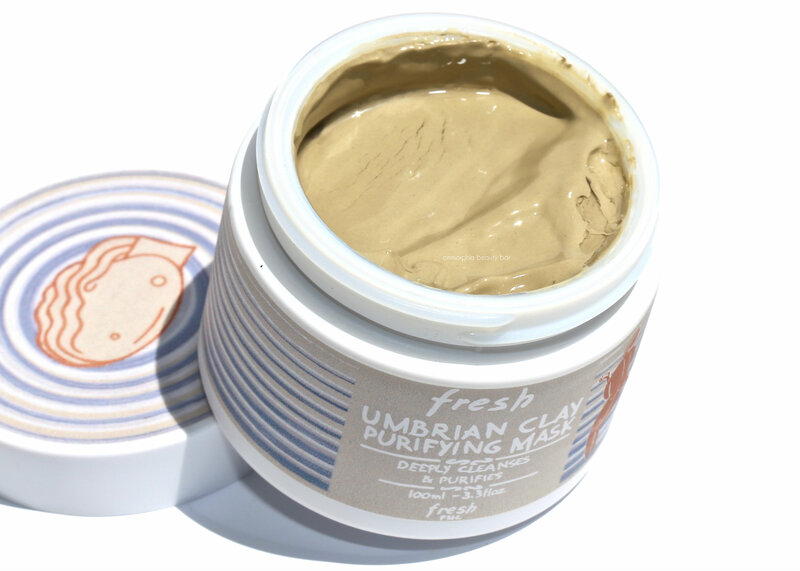 Umbrian Clay Purifying Mask (CAN $70.00) | In 2017, Fresh collaborated with Rometti, a ceramics workshop based in Umbria, Italy, to create the limited edition packaging seen here and while this particular version may no longer be available, rest assured that this cult-fave mask is not going anywhere. A “triple-threat” product, this can be used as either a daily cleanser (for those with very oily complexions), weekly to instantly purify skin (and help minimize the appearance of pores), or as a spot treatment for minor skin breakouts. Some of the hallmarks of this mask are its high mineral content (helps to balance, purify and clarify skin), Sandalwood (known for being both an astringent and a calming agent for the complexion), Olive Leaf Extract (helps to promote suppleness and protects against free radicals), and Chamomile Flower along with Lavender Water (to help soothe skin and prevent dryness). If you’re at all familiar with clay masks, then you know the ‘apply-let dry-remove’ drill which may seem to temporarily shrink pores down to nothing, but usually winds up leaving the complexion feeling drier than the Sahara. This mask, however, is unique in that skin never feels papery once done — just don’t expect major hydration, either. The cool thing is in how it works as a gentle yet totally effective deep cleanser: by applying a small amount to dampened skin and rinsing off almost immediately (the motion of actually applying it is enough to create the friction required), you avoid stressing the skin but still get a thorough cleansing in. Done and done. 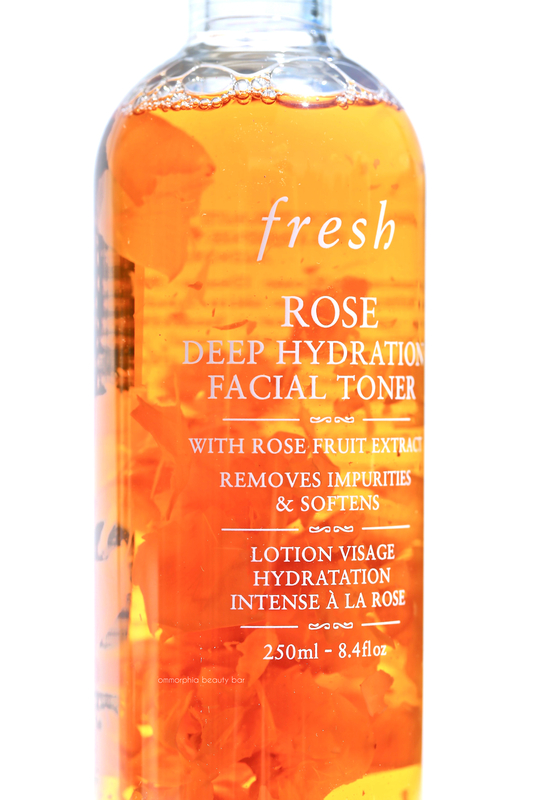 Rose Deep Hydration Facial Toner (CAN $54.00) | You literally had me at rose petals. Seriously. As someone who tends to skip toner, this version is one that I actually look forward to applying. Fitting in perfectly with the whole “liquid skincare” trend, this toner takes things a step further by not only helping to soothe and rebalance the complexion after cleansing, but provides long-lasting hydration benefits as well. Even before you actually use the toner, you’re treated to the visual beauty of real rose petals from the Rosa Centifolia flower floating almost languidly in the formula, followed by the heavenly rose fragrance of the actual product. And all this before you even apply it! Created with Rose Fruit Extract (to help refine pores for a more even complexion), Rosewater (for its rebalancing and astringent properties — 2.2 tons of rose flowers are actually needed to make 1 kilogram), Rose Flower Oil (provides nourishing and long-lasting hydration), Angelica Leaf Extract (helps skin retain its moisture levels), and Hyaluronic Acid, renown for its ability to attract & maintain moisture in the skin. As I said above, this toner has become a vital step in my daily skincare regimen as it not only serves to remove any last traces of makeup and dirt after cleansing, but leaves my skin actually feeling petal-soft. Coupled with the delicate rose fragrance (not the noxiously cloying scent of artificial rose, thank you), there’s a storied and almost ritualistic feeling to using this product, something that strikes a chord with me and just feels so right. 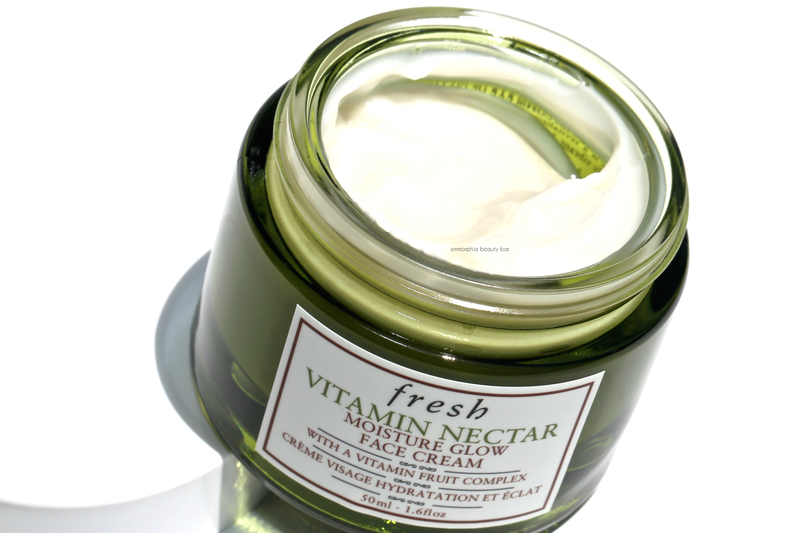 Vitamin Nectar Moisture Glow Face Cream (CAN $55.00) | Think of this as a multivitamin in face cream form. Following the huge success of the brand’s Vitamin Nectar Face Mask, Fresh went back to the drawing board and created the perfect accompaniment to that with this product. A lightweight moisturizer that packs a major skin-brightening punch, it serves to ‘awaken and energize’ the complexion while still protecting moisture levels. Bearing a proprietary Vitamin Fruit Complex of Vitamin C (brightens & tones), Vitamin E (protects, softens & soothes) and Vitamin B5 (emollient and smoothening), the formula also has Lemon and Orange Fruit Extracts (helps in toning & refining the skin with naturally occurring AHA’s, removing dry skin through non-mechanical exfoliation), a mineral complex of Magnesium, Copper & Zinc (works to revitalize tired looking skin), and Glucosyl Hesperedin, a naturally derived flavonoid found in citrus fruits that helps combat lacklustre complexions. I’ll be totally honest here; I have only briefly tried this cream and have yet to give it a more thorough testing. That said, with Spring about to hit (fingers crossed it happens soon), I couldn’t think of a better time to put this to use, as this past Winter has been extraordinarily harsh and has really taken a toll on my skin. I’m ready to brighten and reenergize, and will definitely update once I have more info to go on. I will say, however, that even with the little I’ve seen, something tells me I’m going to really enjoy using this cream as the texture is wonderfully light and the fragrance is a citrus-lover’s dream. Moisturizing Hand Cream (CAN $18.00/each) | You will NEVER find me without hand cream stashed in my bag. Or anywhere else that’s within easy reach around here, for that matter. So you might say that I’m somewhat obsessed with keeping my hands well-moisutirzed but my standards are VERY high, and I do have my favourites (L’Occitane & CHANEL). Introduced last Summer in the brand’s lineup, the fragrances of each cream were inspired by travels from the two co-founders; Honeysuckle from when Lev Glazman walked through the village of Penne d’Agenais in the Lot-et-Garonne region of the French countryside, and Citron de Vigne from Alina Roytberg’s visit to France’s Champagne region. Formulated to be highly skin-nourishing without leaving a greasy feel behind, they contain Cupuaçu Seed Butter (an exotic butter which helps to moisturize, nourish and promote suppleness), Sal Seed Butter (native to India, this rich intense butter helps to prevent dehydration), Shea Butter (renown skin shielding & hydrating properties), and Vitamin E which protects, soothes and softens skin. Along with being very hydrating and skin softening, both are also perfectly sized for travel, and would even make a very thoughtful Hostess gift. That said, I find that the formula leans on the rich side and does absorb — albeit at a slower rate than I’m used to. One thing’s for sure, these creams will be coming with me on my next trip as they’ll make the perfect antidote to beach-parched hands. 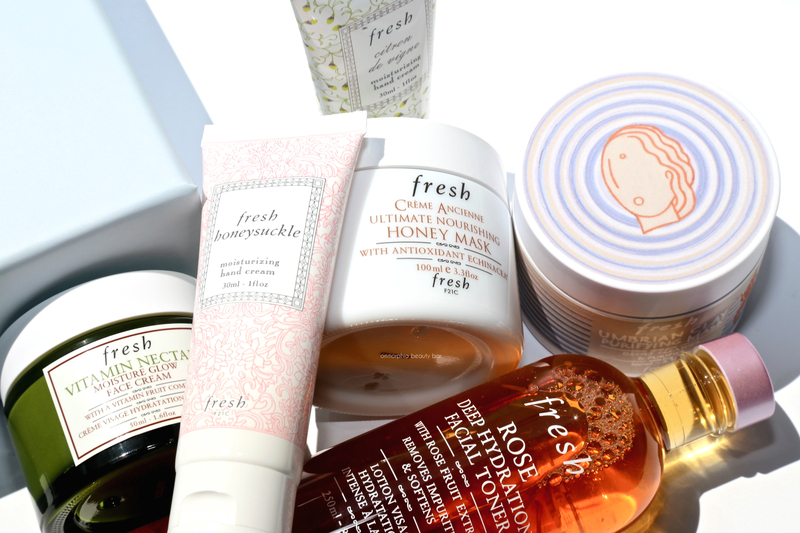 Skincare has become a force to be reckoned with, and not something just for a certain age demographic either, as even 20-somethings are recognizing the benefits that implementing a good regimen can have. As skin is the largest organ on the human body, the better you take care of it, the better it will behave & appear, which in turn means the better you’ll feel about what you’re presenting to the world, and ultimately that’s the ticket: feeling good in your own skin. And while I have many products I turn to at any given time (seriously; just check out my Skincare Highlight on my Instagram bio to see some other options), Fresh is hitting all the right buttons for me: from their packaging (I actually really love the font used as well), all the way to the formulations and judging by the results I’ve seen to date, any/all shown here are well worth looking into. By the way, please let me know if you’ve got any faves from this brand that I should check out — I’m always up to discovering something new!